As a service to those who attend the concert hall, Miyama Conceru (Kirishima Concert Hall) provides a system for dispensing tickets for seats that match the audio preferences of the patron (the seat reservation and ticket issuing system). This system is implemented by acoustical devices and computers installed in a testing room. In addition to this function, an acoustical CAD system, a performer support system and other software systems for managing the hall, including event control, customer control, booking and renting out of facilities, are also running as subsystems on a local area network (LAN). Figure 4.1 shows a block diagram of the preference test. After selecting the musical motif, those parameters related to the motif are fixed. An individual's most preferred values, [LL]p, [Dt1]P, [Tsub]P, can be measured by the paired comparison test. For IACC, a smaller value for this parameter is always preferable. The acoustical CAD system can calculate the above four parameters individually for all the seats in the hall. Then the seat that an individual would find the most agreeable is determined from the values of the test results of his preferences for each parameter and the predicted values at the seats. Figure 4.1. 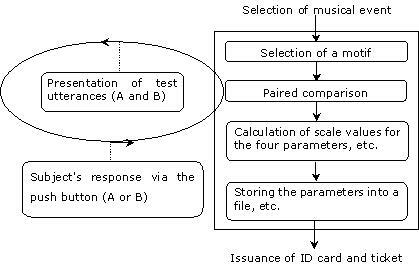 Block diagram of the preference test, Photo reproduced with kind permission of Mr Suiyo Sato, Suikoh-sha, Tokyo, Japan. Twelve musical motifs were chosen for the compositions expected to be performed more frequently at Miyama Conceru, including short string pieces, wind pieces, piano solos and violin solos. For all of these, dry source recordings were used, with permission, from commercially available CDs. Table 4.1 shows the measured parameters for 12 motifs. Source 1: The original tape was made by Gottingen University. Source 2: Japan Audio Society (CD-3), 'Impact 2'. Source 3: DENON, Vol.2 (DENON COC0-75085). Ts(s): The elaspsed time from the beginning of the specified track to the starting time of the motif. Td(s): The duration time of the motif. te(ms): The effective duration time of the autocorrelation function at which the envelope of the normalized autocorrelation function (ACF) becomes just 0.1. For the listening level, the peak of the motif signal was fixed at the five levels 70, 75, 80, 85, 90 dBA (time constant 100 ms, peak) and the interaural cross correlation was set at the three levels 0.4, 0.75 and 1.0. For the initial delay gap and reverberation time, it is known from previous studies and experiments that the tested subject's overall average [Dt1]P, [Tsub]P, can be inferred from the effective duration time te of the autocorrelation of the musical motif signal. The parameter Te refers to the time at which the envelope of the normalized autocorrelation function (ACF) becomes just 0.1 of its maximum. The time duration of the total signal used for obtaining the ACF was 2 seconds. In the actual preference test, the time delay and Tsub values are set around these inferred values. The value of the level of the four parameters for motif 1, for example, is as listed in Table 4.2. A comparison pair is presented by the time schedule shown in Figure 4.2. 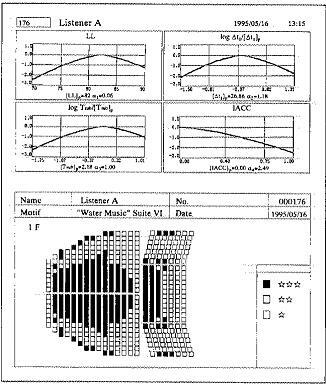 Since it is assumed here that there is no order effect of the presentation, the number of test signals totals 33 pairs, including 10 each for LL, All, Tsub and three for IACC. The tested subject listens to a pair of test signals, then responds with a switch indicating which alternative he prefers. The subject is told when to respond by an audio instruction saying 'Please press'. It takes about 15 minutes to test for the 33 pairs. Figure 4.2. Sample of a paired test utterance. When a person who has taken a preference test wishes to buy tickets for a concert, he hands over his individual ID card to a ticket-issuing operator, and then a view of the concert hall seats is displayed on a computer screen, classified into three grades according to the concert-goer's preferences (Figure 4.3). Figure 4.3. Ticket issuing by using customer's ID card. Reproduced with kind permission of Mr Suiyo Sato, Suikoh-sha, Tokyo, Japan. 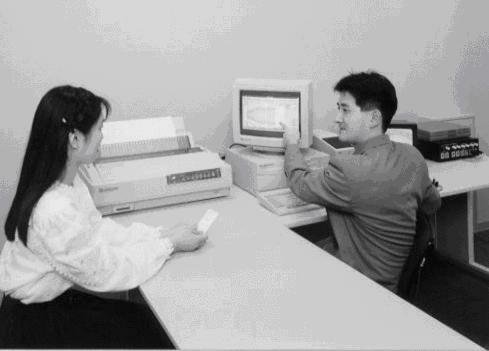 The results of the display are printed out, allowing the patron to inspect the results and either choose his seat then, or to reserve a seat later by telephone. Initially the preference grades are classified into three levels (Figure 4.4). The advantage of this reservation system is that it allows each user to enjoy music with the assurance that he is hearing the concert from 'his' seat. Figure 4.4. The preference grades classified into three levels. 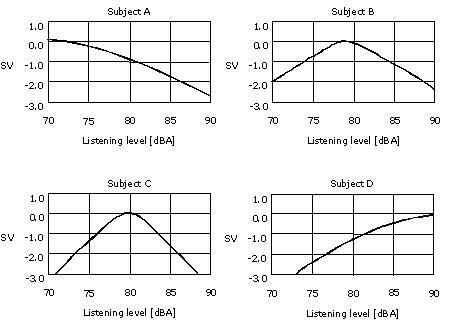 Figure 4.5 shows samples for measured preference curves of four subjects for the listening level parameter. This shows that the peak and curvature of the preference curves are individually different. This indicates that people have strong preferences concerning sound fields. These results are stored into a file on the database for concert-goers. Then an individual ID card is issued. Figure 4.5. Measured preference curves of four subjects for listening level. 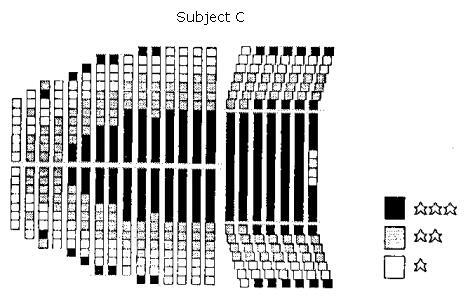 A selection system was introduced to maximize the preference of each individual with respect to the sound field as described by the four acoustic factors. 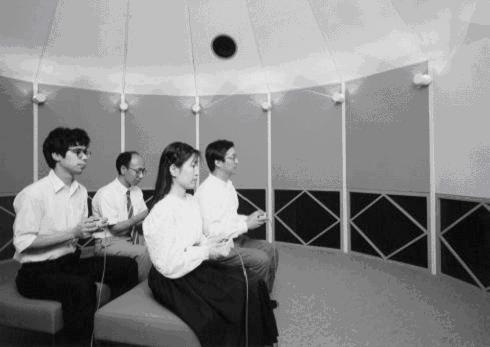 Preference tests were performed in a listening room simulating the sound fields with multiple loudspeakers installed in the Kirishima international concert hall. Suitable methods can be to use either the paired-comparison test or a method of adjustment by the listener, or a combined method that obtains the most preferred combination of LL, Dt1, and Tsub. To examine the preference as a function of the IACC, only the paired-comparison test is applicable, because a smaller value for the IACC is always preferable. Preference tests were performed using several music motifs. 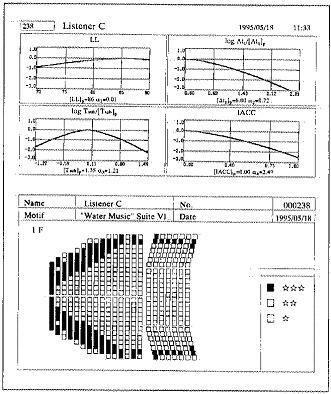 Since it is assumed here that there is no effect of the order of presentation, the test sound fields were tested using a total of thirty-three pairs, with five levels of LL, Dt1, Tsub, and three levels of IACC. The duration of each stimulus is about 10s. It takes about 15 minutes for each listener. Scale values of individual preference as a function of each physical factor were obtained by the simplified method given in . An area of seats where individual preference is maximized can be found. The large individual differences in the most preferred listening level are at least partly related to the individual hearing level. The preferred initial time delay and the preferred reverberation time are associated with an individual preference for ''liveness". Generally, the preferred values of LL, Dt1, and Tsub for each individual are quite different, but all of the subjects tested always preferred a small value of IACC. Examples of preference-test results for three individuals using Suite VI from the 'Water Music'' by G. F. Handel (te = 62ms) are shown in Figure 4.6. Listener A shows a preference similar to the global preference for each factor. Figure 4.6. 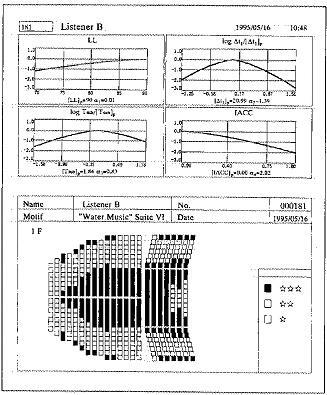 The results of preference tests and preferred seats graded into three levels: Listener A, B, C.
Listener B is recommended to sit close to the stage because he prefers a high listening level. The listening level is designed to be nearly constant throughout the hall; however, a large variation in the listening level may be useful for meeting the large range of individual preferences in listening level. Listener C is recommended to sit near the side walls because he prefers a short initial time delay gap. The preferred value of each physical factor is very different. The range of preferred listening level, for example, is much greater than 20 dB (A) due to the individual difference of the hearing level. With regard to the reverberation time, the range of preferred value is 0.5-4.5 s . The initial time delay gap also has a great range of preferred value. To maximize the individual preference, such facts must be considered. The results of the preference tests for each individual have been discussed in terms of the inter-individual differences . The investigation shows that subjects with small inter-individual difference have critical preferred value indicating large values of ai in equation (6), chapter 1. On the other hand, the preferred listening level for the subjects with small values of ai are barely determined. 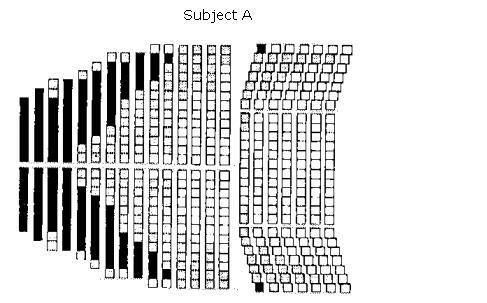 The individual subjective preference may be met using the seat-selection system based on the four orthogonal physical factors of the sound field for each seat. Examples of scale values obtained by preference tests and the results of seat selection to maximize individual preference are demonstrated.